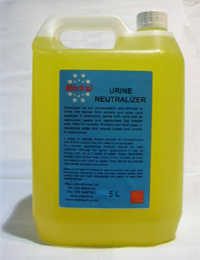 Aquaclean Urine Neutraliser & Remover was developed for the neutralisation and removal of urine and faeces from carpets and other hard surfaces. It chemically reacts with urine and its associated gases and deodorises the treated area. Ideal for carpets, linoleum and tiled areas in residential areas and around toilets and urinals in washrooms. Always pre-test carpet or other fabric materials to ensure that they are colourfast. For normal applications product should be used undiluted although for lighter applications it may be diluted with up to 3 parts of water. Spray neutraliser directly onto the soiled area. Allow a few minutes to work and absorb with a clean cloth or paper. Area should be cleaned with carpet shampoo as normal.